A fire crew from Dogsthorpe was called to a fire in Drain Road, Newborough, Peterborough, after a pile of school books was set alight. Firefighters used hose reels to extinguish the old books after they were called out at 3.08pm yesterday. 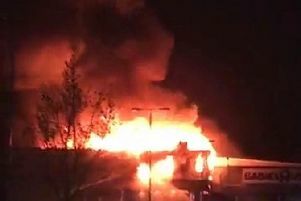 Cambridgeshire Fire Service confirmed the cause of the fire was deliberate. Anyone with information should contact the police on 101 or the independent charity Crimestoppers anonymously on 0800 555111. Watch Commander Tony Fitzjohn said: “We appreciate that leaving school for some is a time of celebration, however, this sort of behaviour is anti-social in our community. A crew from Dogsthorpe was called to a grass fire near a children’s playground in Buckland Close, Netherton, yesterday at 1.54pm. The cause of the fire was unknown. A Dogsthorpe crew also tackled a bin fire near a bus stop in Lincoln Road, Glinton, at 12.34pm yesterday and a bin fire which spread to a hedgerow in Westwood Park, Hampton Court, Westwood, at 12.15pm. The cause of the Westwood fire was deliberate. Anyone with information should contact the police on 101.